Written by Samuel and Bella Spewack, with music and lyrics by Cole Porter, Kiss Me, Kate revolves around the tangled love lives of theatre actor/producer Fred Graham and his leading lady and ex-wife Lilli Vanessi. A second romance also takes place between Lois Lane, the actress playing Bianca, and her gambler boyfriend, Bill Calhoun. The musical pays homage to William Shakespeare and is set during a fictitious musical version of The Taming of the Shrew. The show made its debut on Broadway in 1948 and won the first Tony Award for Best Musical in 1949. Smart, stylish and scintillatingly witty, Director Jo Davies rises to the difficult challenge of delivering Porter’s mischievous musical to a modern audience, with a production that loves, honours and obeys the original material. What makes Opera North’s production of Kiss Me, Kate so special is that every element of it works. Colin Richmond’s breathtaking set design looks stunning, contrasting the splendours onstage with the grubbiness of backstage. Will Tuckett’s choreography explodes with energy, with sizzling showpiece parades of Another Opening, Another Show and Too Darn Hot. Add to this a superb performance from the talented cast and you can’t go wrong. Dutch baritone Quirijn de Lang plays Fred Graham/ Petruchio, the magnificent rotter who struts around dressed head to toe in black leather. Jeni Bern gives as good as she gets as his former wife Lilli Vanessi. Her superb performance of So In Love is one of the highlights of the show and her hilarious scene during the act 1 finale certainly gives her upper extension a workout. Tiffany Graves shines as Lois Lane, stealing the show with three reprises of Always True to You in My Fashion. Ashley Day is equally good as her partner, Bill, demonstrating his fast-paced tap dancing skills in the show-stopping number Bianca. A special mention has to go to Conductor David Charles Abell and his 40-piece orchestra, whose re-imagining of the original score is fresh and authentic. 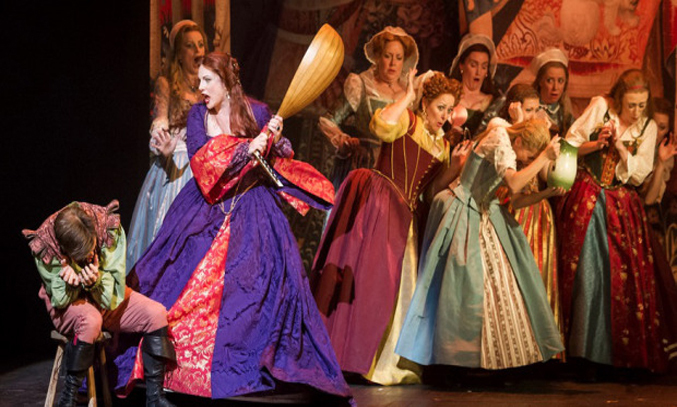 Aside from a few minor issues with the sound, Opera North’s re-imagining of Kiss Me, Kate is otherwise flawless and a spectacular production not to be missed. A laugh-out-loud comedy will leave you feeling ‘Wunderbar’.